Make Money Online Uploading & Sharing Video On Ireporterstv.lots of people have been asking me how they can make money online in Nigeria and get paid to their nigerian bank account without stress.well, here is an online opportunity for you to start making money online in Nigeria with ireporterstv.co website.i know most of you must have been hearing about ireporterstv.co but don't really know what the site is all about.today i will share with you on what ireporterstv is all about and how to make money by either uploading your own video or promoting other peoples video.for those who don't know what ireporterstv is all about, then let me explain a little of what the website does. 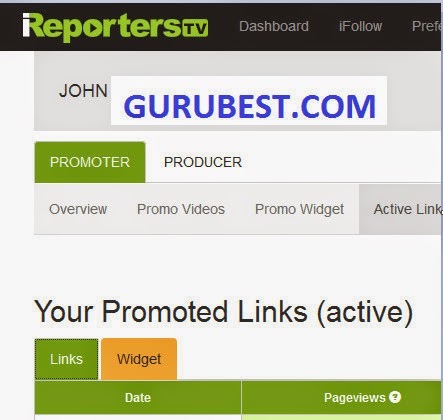 ireporterstv is a website that enable you to make money from any video you upload and also any video you share with your friends on social media website like facebook, twitter, pinterest, instagram and other website like forums or blogs.you will get paid straight to your bank account in nigeria at the end of the month.ireporterstv is a video sharing website just like youtube but this time around, they will pay you for uploading and sharing of any video on the website.they pay you if any one clicks on the link to the video you shared with your friends and also pay you if any one views the video you uploaded to the website, great isn't it. this is what some people have been using to make money online here in Nigeria, you don't need PayPal account because they will transfer the money to your bank account since they have wire transfer payment option.so any video you recorded with your mobile phone, it can be a news, personal video, happenings, event,funny video etc.if such video can trend online, then you will have massive views because other people will promote it which means more money for you. they have what is called ipromoter and iproducer.ipromoter means people who wish to be promoting/sharing any video on the website with their friends on facebook, twitter or any other website or forum.since many people can't do the video recording, you can apply to be an ipromoter and just copy any top video and start sharing.any clicks you get from the link, they will credit your account on their platform.while on the other hand, iproducers is for those who want to also upload video content on the site. so any video you have or personally did, you can upload it and start making money from any visitor that views the video, you will also make money promoting the video on your facebook timeline or twitte. registration on the site is free.so register today and start promoting/sharing ireporterstv videos to start making money while surfing the internet.CLICK LINK TO CREATE AN ACCOUNT FOR FREE. No Responses to "Make Money Online Uploading & Sharing Video On Ireporterstv.co"